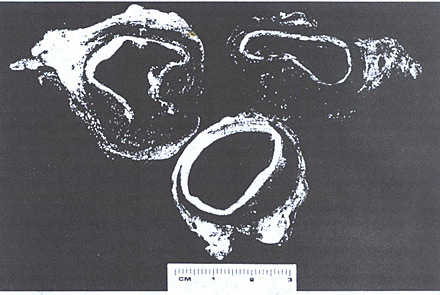 A necropsy specimen from an elderly woman who died suddenly after having severe back pain suspicious of aortic dissection. It demonstrates a penetrating atherosclerotic plaque (upper left) providing communication from the aortic lumen to an adjacent medial hematoma (bottom). An aortogram had been negative for dissection, but transesophageal echocardiography revealed the medial hematoma. Reference:Lindsay,J.,Jr.,Diagnosis and Treatment of Diseases of the Aorta, Hurst 's The Heart 10th edition,pages 2375-2377.